PACK & SEND has a team of trained specialists to pack any parcel from delicate valuables to large and bulky boxes. PACK & SEND’s experts specialise in selecting and accessing the perfect materials for any package with the ability to build first-class custom crates and boxes. This means your shipment is always in the best hands. 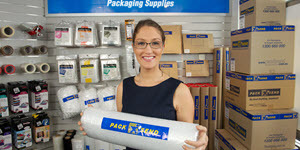 Save you and your team time, space, and resources by using PACK & SEND as both your packing and shipping department. Get those bulky packing resources out of your office and be sure your shipment is packed correctly, be it a single item or a thousand different pieces! For added 'peace of mind', packed items delivered by PACK & SEND can also be protected from loss or damage through our Freight plus Warranty extended service option.